BennuLife leads the advancement of anti-aging therapies with our facial rejuvenation treatments. With over a decade of expertise in cell therapy, our scientists have developed proprietary technologies to help you repair and maintain the cellular health of your skin. Scientists have determined that the mesenchymal stem cell (MSC) is the cell responsible for producing fibroblasts. If MSCs are either indirectly or directly (see diagram below) introduced into the dermis, they will reproduce themselves as a stem cell as well as differentiate into brand new fibroblasts. These new fibroblasts will produce collagen, elastin and GAG to help restore and maintain the skin’s firmness, elasticity and hydration. We apply cell therapy to facial aesthetics in two distinct ways to utilize your body’s own natural growth factors, proteins and stem cells to reduce wrinkles, scarring, dark spots and offer a more rejuvenated appearance. PRP (PLATELET RICH PLASMA): Our nurse obtains a small sample of blood from your arm then concentrates the powerful platelet rich plasma. The PRP recruits fibroblasts and mesenchymal stem cells to the skin, stimulating the formation of collagen and promoting healing. BONE MARROW MESENCHYMAL STEM CELLS (BMCs): Our board certified doctor removes a sample of your bone marrow from you hip. Your stem cells and growth factors are then concentrated and infused directly into the skin. They can produce collagen, elastin and GAG to help restore and maintain the skin’s firmness, elasticity and hydration. Why Are MSCs So Important For Skin Quality? Our skin is dependent on a few factors to retain its elasticity and integrity. Collagen, elastin and glycosaminoglycan (GAG). These factors are produced by a highly specialized cell called a fibroblast, a cell type that peaks in concentration when we are in our 20’s. 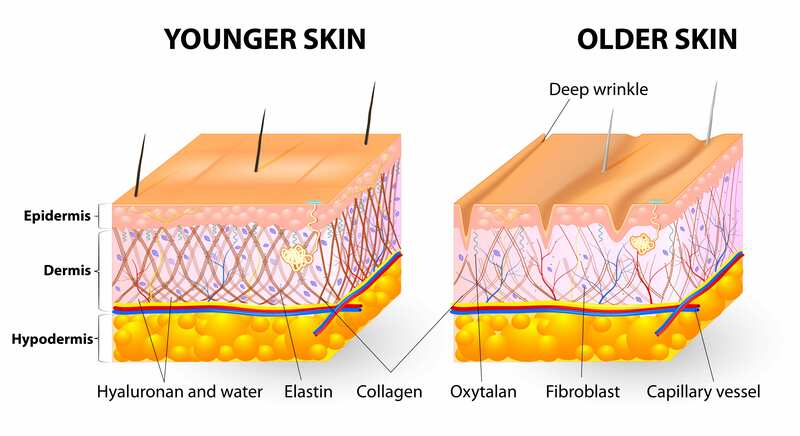 As we age, these cells diminish, causing our skin to change in texture, color and composition. As this process advances, we succumb to gravity and our skin wrinkles and sags and is less efficient at retaining moisture. Research has shown us that PRP and MSCs are responsible for stimulating dermal fibroblast proliferation and increasing type I collagen synthesis. This means if the cells are either directly or indirectly introduced into areas of our skin, new fibroblasts will develop and effects of the aging process will begin to reverse. Soon after treatment, your skin will be energized to begin producing collagen, elastin and GAG at the same rate as it did when you were younger! PRP+ : Our trained nurse or technician obtains a sample of your blood from your arm. BMC+ : Our board certified doctor aspirates a sample of your bone marrow from your hip bone. Our FDA-approved and patented technology concentrates the regenerative properties of either your blood or bone marrow sample. Our unique device allows us to concentrate up to 6x more wrinkle-reducing and collagen building proteins than our competitors. We pride ourselves on using the safest and most effective technology available. We begin the treatment by cleansing your skin with a light enzymatic solution. This is followed by a gentle exfoliation using microdermabrasion to maximize your cellular therapy and give you a post-procedure glow. BennuLife’s unique micro-needling device creates micro-channels while simultaneously delivering your cells’ powerful healing properties into the skin at the precise depth research shows to be most effective to increase collagen and elastin production. This results in plumping of the skin as well as reduction in visible fine lines and wrinkles. This treatment stimulates your bodies OWN healing capabilities that work to improve your skin for weeks after the treatment. We complete your procedure with a Red Light LED Therapy treatment that promotes collagen stimulation, suppresses inflammation, and reduces irritation, redness and bacteria living underneath the skin. Finally, you will rest comfortably while a cooling and hydrating mask calms the skin to leave you fresh and glowing! This treatment is designed to stimulate skin rejuvenation from a cellular level so the effect is gradual. Most people begin to see improvement in their skin quality within weeks of their treatment. Immediately following a facial, you will be able to leave the office and go directly about your day. You will be slightly flushed and glowing, but generally look refreshed and healthy. The collagen reformation and fibroblast proliferation will occur gradually, so the quality of skin will continue to improve over the next few weeks. Our research and clinical experience suggests that the optimal results occur when a series of three facial treatments are performed on a monthly basis. Some may also choose to have an occasional maintenance facial to boost the effects. However, many people are satisfied with just one treatment and don’t complete the entire series. The most important thing to remember, is that the effects of our PRP Facials will always look natural and healthy. Friends will mention you look younger, rested and refreshed, but they may not be able to pinpoint exactly what has changed!